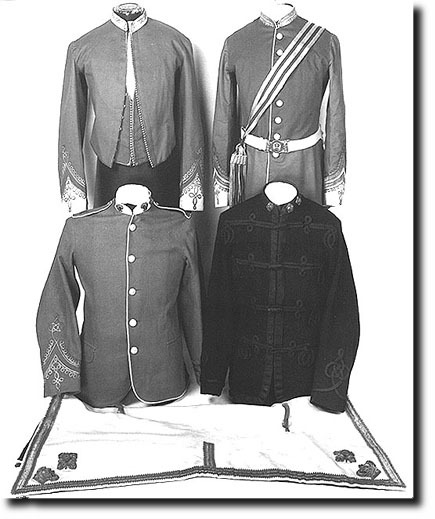 Top left is the Colonel's mess jacket and waistcoat, scarlet with white collar and cuffs and field rank double gold braiding. Next to it is the full dress tunic (see Detail ). Below that is a universal pattern infantry patrol jacket with colonel's bages of rank on the collar. It is dark blue with black mohair braiding and lace round the collar, front edge, and hem. Next to that is a frock used for drill and campaign wear instead of the smarter full dress tunic. It is red faced white with white piping down the front and along the hem. A crown and pip are on each side of the collar. The buttons are the same as for the tunic and the white piped scarlet shoulder-straps have a figure 8 embroidered in gold. The sleeve ornament is the same as for the mess jacket, braided but no lace. The saddle-cloth at the bottom is white and edged with inch wide gold lace on scarlet cloth backing that has a dog-tooth edge. The corners have a large crown and pip.